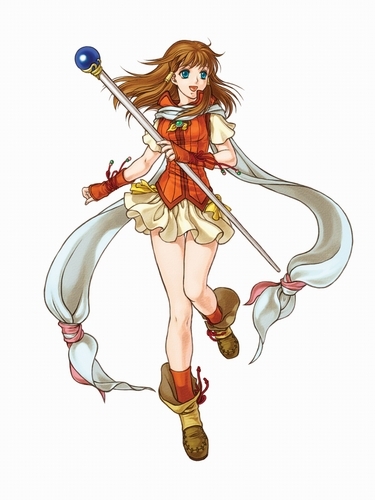 One of the main characters in Radiant Dawn. A sequel to Fire Emblem: Path of Radiance, Radiant Dawn is yet another turn based strategy like game with a basic plot line meant to finish what Path of Radiance started. 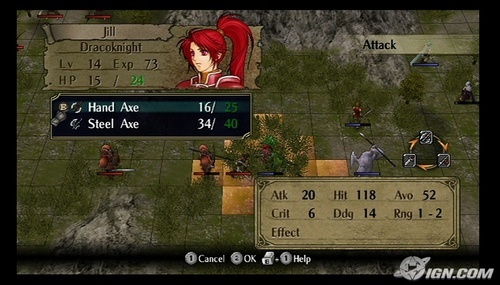 Overall, Radiant Dawn has good gameplay and a decent storyline that does indeed complete Path of Radiance. However, there are elements in this game that consumers should heed first before buying. 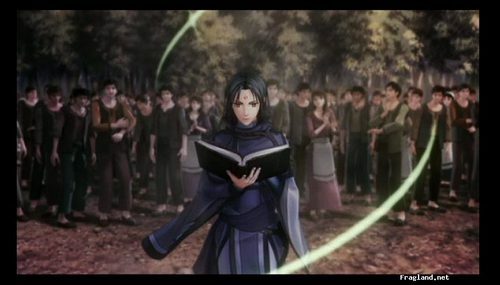 The basic story combines three separate parties with different individual goals and takes place three years after Path of Radiance. At the end, they must converge in order to save the world and history. 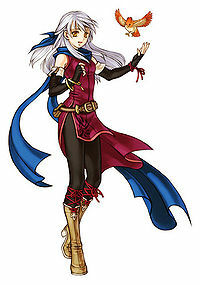 The first group is the Dawn Brigade under the Silver-Haired Maiden, Michiah. She is known for her visions of the future and seeks to liberate Daein from Begnion rule. In the previous game, Daein was defeated by the nation of Crimea and became Begnion's auxiliary nation. The second group takes place in Crimea, where even after three years of reconstruction from the war, the nation is still in shambles on the brink of civil war. This part introduces the character, Elincia, the queen of Crimea. 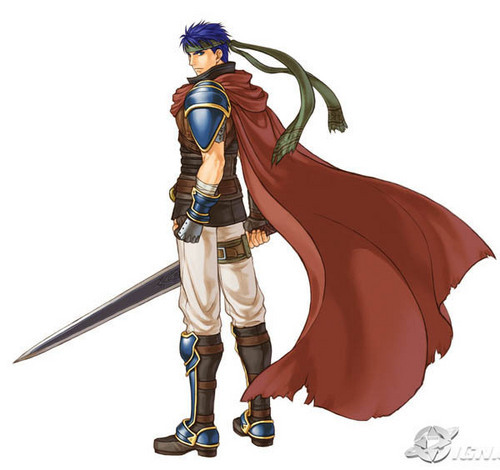 The third group is that of the Greil Mercenaries led by Ike, the main protagonist from Path of Radiance. They aid the Laguz alliance in getting revenge from the Begnion Senate for the destruction of a sacred forest. Albeit a clever idea, the way Radiant Dawn merges the company is not quite convincing. The groups are initially put against each other because of the Senate manipulating backstage. The individual plots were ok and in fact were very good, but when the groups merged as they did, the story no longer made sense. The plot was ok when kept on this level nonetheless. Fortunately, the superior gameplay addiction sort of clouds the confusion. The plot really fell at when the Lehran's Medallion was released, and the dark god awakened. Although this brings a supernatural dimension into Radiant Dawn, it fails because the plot was not properly set up for that particular scenario. In other words, the player was not ready for such a dramatic shift in the story. In fact, this actually contradicts Path of Radiance's philosophy on keeping the game all natural. As for the subplot and development, that was even worse. Path of Radiance did a good job in giving the characters special personalities through one star conversations at the base and support relation conversations. However, Radiant Dawn almost completely sacrifices the character-developing conversations in order to aid the weak plot. So, the characters no longer get a sense of individuality which weakens the game as a whole. This was a major disappointment that I would have hoped got more attention. A simple sample of the battle grid. Enough with the plot. As for the overall gameplay, it was very good. Although not as superior as its prequel, the player is captivated by addictive gameplay, and this is one of the things that "hides" the plot. Radiant Dawn keeps the general mentality of taking turns and controlling multiple units to accomplish a goal. 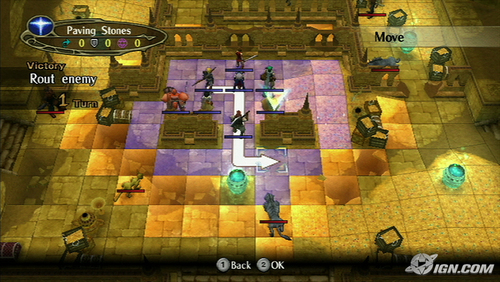 The player is allowed to move units across grid spaces and attack enemies. The graphics have a definite improvement over Path of Radiance, and the way the information is displayed is much more convenient. 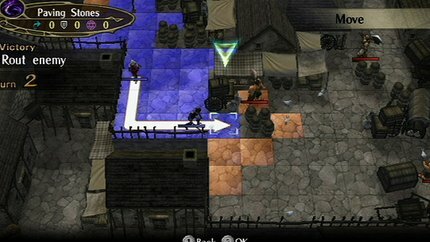 Also worth noting are the new features in the Radiant Dawn environment such as the ledges and height advantages. Character management is also quite impressive. Within the base, the player can customize his/her characters by equipping them with desired weapons or various power ups. This creates a new level of strategy where you have to keep the characters somewhat balanced in order to win upcoming matches. The actual play part of the game is what you would buy this game for. Of course, there are drawbacks worth noting about the gameplay itself. For one, the battles are horribly unbalanced where your characters are twelve times better than the enemy, yet the enemy terribly outnumbers you 5 to 1. The imbalance either overwhelms the player, or the battles become too easy because of how superior your units are. The graphics of the game are straightforward. There is a grid, you have little units that resemble the class, and there is an environment. The overall quality of the sharpness has improved from Path of Radiance, but not by much. The same goes for the battle scenes that are present in both games. They are relatively the same, yet there is noticeable difference. The high quality graphics are shown in the various storyline cut scenes. However, some of those were placed in rather inappropriate spots, or they were too short to enjoy fully. If anything, the graphics of Radiant Dawn should at no point stop a consumer from buying it. Overall, this is a great game, but it does not live up to its predecessor, Path of Radiance. If you want a heart warming story, then do not get this game. However, if you are the type that enjoys strategy games like chess with a twist, then Radiant Dawn is right for you. Since nobody seemed like they were going to edit this, I went ahead and did it my self. Please take the time and read it. If you think it is hard to read, then PLEASE say so. Well done, I would probably be working on this website this evening. It looks excellent! The rating system is impressive.